Many people do not realize that the Germans were methodically killing fellow Germans before they were killing Jews, gypsies, and dissidents. ‘Action T4’ was a medical program that quietly whisked disabled and mentally ill people for extermination. Germans of all ages were targeted. Hundreds of thousands received ‘treatment.’ Fewer people know that the philosophical foundations for the Nazi actions were laid many years earlier, even before the National Socialist party was created. 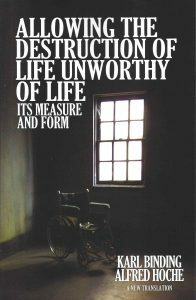 In a sober, academic discussion, professors Karl Binding and Alfred Hoche argued that there were ‘lives unworthy of life’ and for the good of society, and indeed, out of compassion for the worthless individuals, such people could be ethically killed. Binding and Hoche’s book was a turning point in German culture and served as a catalyst for the T4 program, which itself was a precursor to the Holocaust. In this new translation by Dr. Cristina Modak, commissioned by the Policy Intersections Research Center, readers are able to examine the philosophical basis that Germany’s doctors relied on in the 1920s and 1930s. A foreword by PIRC’s director prompts the reader to consider just how far away modern medical ethics is from Binding and Hoche’s arguments.